At Sutter Auburn Faith Hospital, staff members understands that every patient has different needs. For our patients with Parkinson’s disease, the hospital is offering a free exercise class every Friday that is open to the community to help those with Parkinson’s disease stay active and have confidence in their movements. Studies have shown that exercise may help to slow down the loss of muscle and bone mass. The class offered at Sutter Auburn Faith Hospital is founded on the Lee Silverman Voice Treatment BIG principles and is open to anyone with Parkinson’s or a Parkinson’s-like condition. 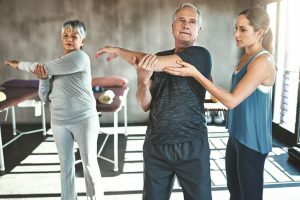 The program is based on current research that emphasizes exercises designed to specifically address the mobility challenges in patients with Parkinson’s disease. The classes will meet every Friday beginning Sept. 8 from 12:30 to 1:30 p.m. The class is free but registration is required. Please contact the Sutter Auburn Faith Hospital Rehabilitation Department at 530-889-6088 to register or for more information.